I couldn’t be happier with my new studio. The possibility of space in McGuffey was a big factor in our decision to move to Charlottesville and I have to say that so far it has definitely met my expectations. The studio itself is really good and conducive for working. High ceilings, big windows, lots of light, nice floors, easy logistics with an elevator that doesn’t demand bribes…what more could anyone want? Outside of my own little studio, there are plenty of great resources such as a gallery, a classroom, and a little library. The place is spacious, relaxed, and dignified and in a great location, right in the heart of town and a short bike ride or walk from where I live. Impressive as the facility may be, the community there might be even better. 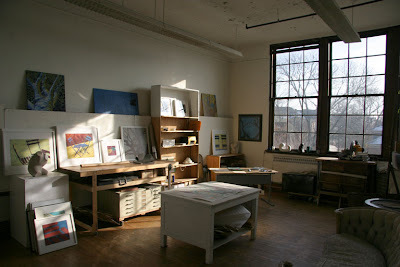 I’ve been in some great studio buildings, been part of artist co-ops, and artist residency programs and McGuffey combines much of those situations. It’s some impressive company and an environment where people really seem to be looking out for one another. It’s a pretty social place; I think the open-door requirement all but assures that it will be that way. Yet we do not need to have our doors open all the time and we can—and do—close them when we really need to concentrate. My raging studio-crush on McGuffey does not take anything away from the Tree House or anywhere I was before, nor do the other communities suffer in comparison to this one. We’ll simply say that I’m happy where I am and that I’m very glad that I applied and grateful that I was accepted.